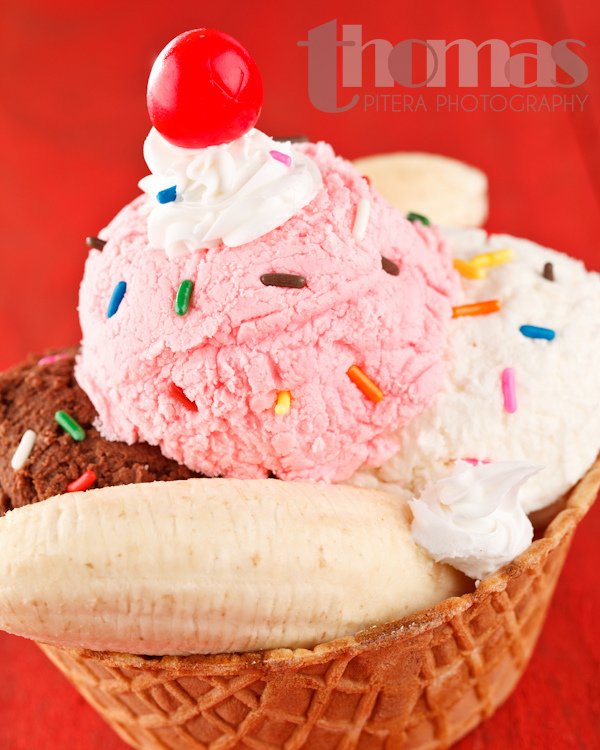 Who doesn’t love a nice bowl (or cone) of ice cream? Personally I’m a huge fan, with mint chocolate chip being my favorite flavor. One thing about ice cream is it can be extremely challenging to photograph since it melts so quickly. 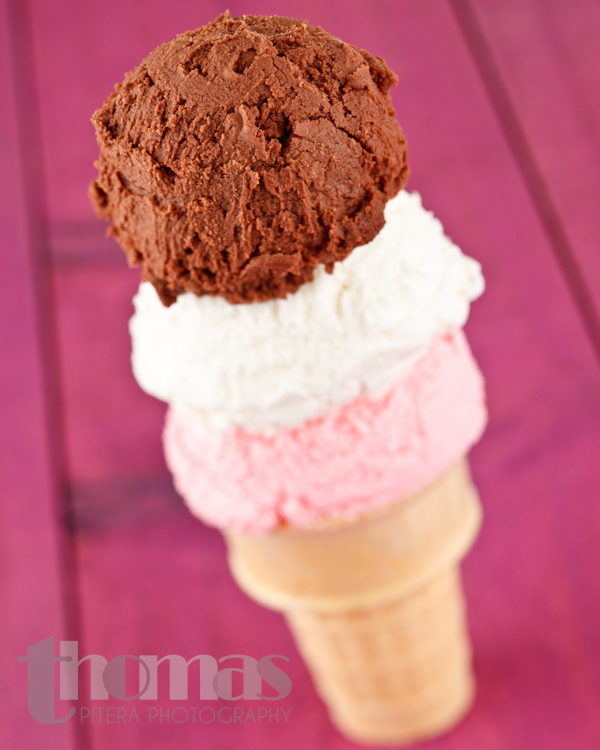 I recently photographed a sherbet cone featured on the back cover of ZEST Digital Magazine. I thought it came out very nicely, but it had me wanting to experiment more with ice cream. When my wife Erika & I found a recipe for homemade ice cream, I thought this would be a perfect opportunity! This is where I should make a confession. The homemade ice cream recipe was actually for fake ice cream. 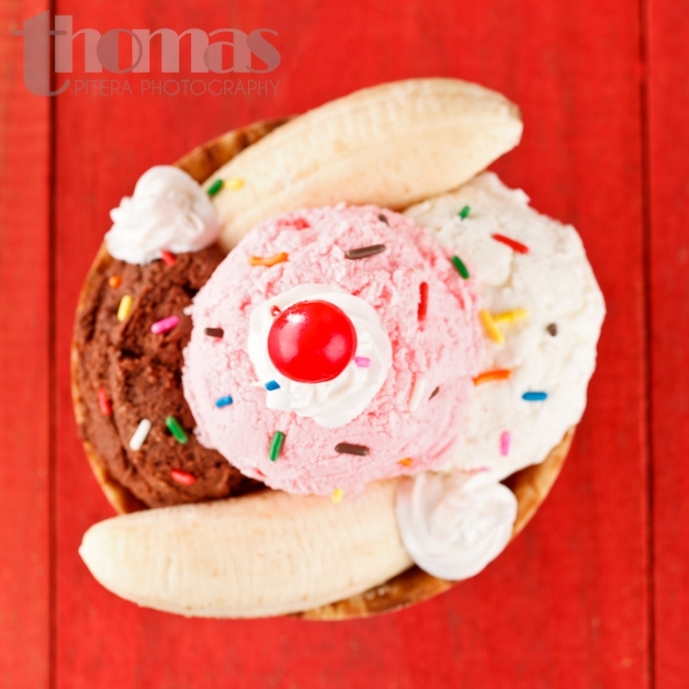 The cherry, banana, sprinkles, and waffle cone bowl you see in the above photo are all real. The ice cream is fake. The “whipped cream” is fake too, it’s actually cake icing. So how does one go about making fake ice cream? All you need is cake frosting and powdered sugar. Put the cake frosting in a stand mixer and add the sugar until the consistency is almost like cookie dough. The results look pretty darn good. Best of all, you don’t have to worry about it melting! The only drawback is it doesn’t really taste very good.